If you ask me, every family vacation should have time allocated for mom to relax and be pampered. 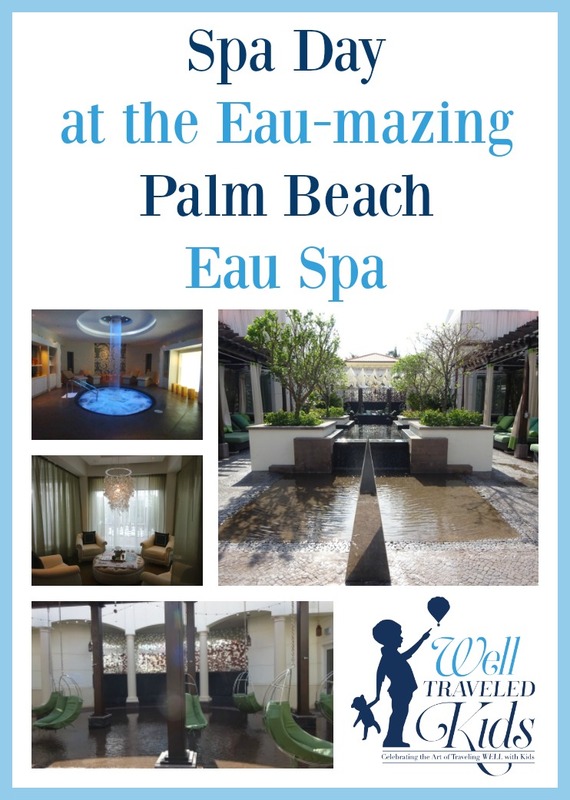 On our fabulous family vacation to Eau Palm Beach Resort and Spa, I was treated to one of my most decadent and memorable spa experiences ever. At Eau Spa, attentive staff encourages you to indulge yourself for a full sensory experience. The spa’s motto of Pause, Play and Perfect is all about taking advantage of “me time” and letting your worries roll away like water off a duck’s back. A day at the 42,000 sq. ft. Eau Spa is magical and whimsical from start to finish. 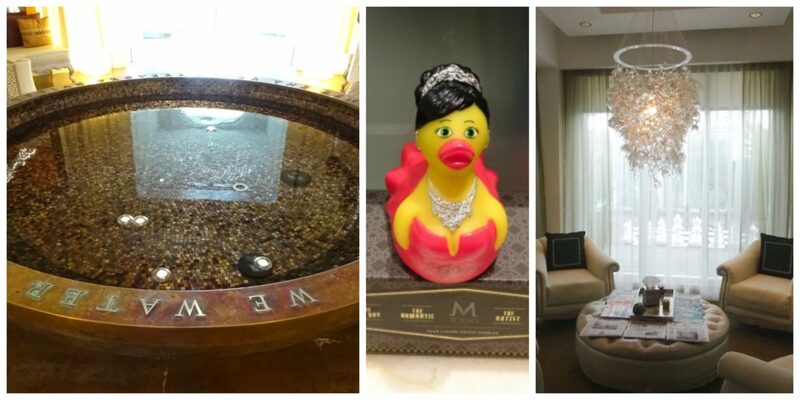 I was a lucky duck to spend a morning alone enjoying being pampered at such a luxurious place. My spa adventure started with lighting a candle, making a wish in the spa’s wishing well, and washing it down with a spoonful of the most deliciously sweet locally sourced honey. Next stop was a meeting with the mixologist at the custom body scrub and polish bar to select a perfect scrub to enjoy after my treatment. I chose a playful blend of citrus and eucalyptus for my do-it-yourself scrub kit. The relaxation lounge areas are stunning and complete with cupcakes, champagne, and champagne glass chandeliers. 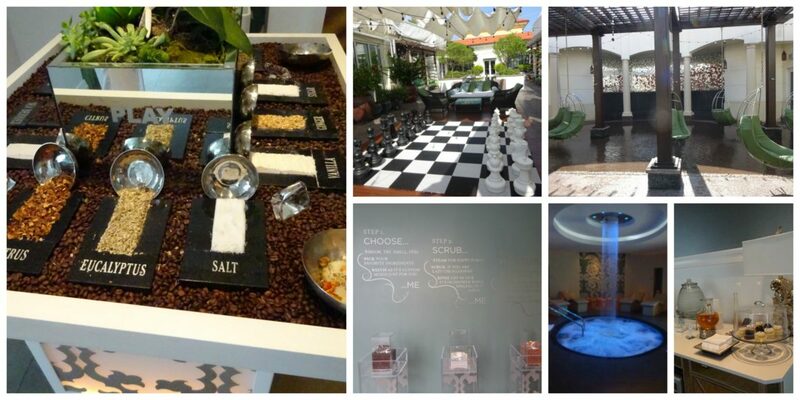 The spa continues the theme of Pause, Play, and Perfect into the treatment rooms, and my treatment was unforgettable. The facial therapist was outstanding and really made sure my treatment was a full sensory experience. Not only could I pick the theme of music in the room with a wide range of fun options, but I also could select the lighting color during my treatment, as well as the fragrance. I opted to focus on the Play portion of the motto for an energetic and playful experience. I surrounded myself with citrus and eucalyptus scents, red color therapy lighting, and upbeat lounge music for my facial. I loved the energy that the color, scents, and music brought to my treatment. Then, I was given another spoonful of the special Eau honey for a sweet ending. Afterward, I went outside into the spa’s Self-Centered Garden for some adults-only alone time. I sipped champagne and nibbled on a cupcake while relaxing on the swings, my toes splashing in the pool below. Now that was some quality me time. Next, I headed to the bath lounge hydrotherapy area and soaked in the whirlpool. I then went to the showers and applied my custom Play-themed body scrub, which left my skin silky smooth and radiant. My morning was coming to an end, and I needed to pick up my son Harry at the AquaNuts kids club. I went to check out and picked one of Eau Spa’s fun-themed rubber duckies as a souvenir to remember my indulgent morning. As I adored every minute of my spa time, Harry loved his play time with the awesome staff at AquaNuts. I could have easily spent more time at the spa. Next time we stay, we will absolutely plan for him to enjoy a full day at AquaNuts so that I can splurge on additional treatments and spend a full day relaxing at the spa. Heading to Palm Beach and wanting to plan an incredible spa day? Pin this for later! Thanks to Eau Spa for treating me to a fabulous morning and a facial for purposes of review. Eau Spa was one of my all-time favorite spas, and I absolutely can’t wait to return on my next visit to Palm Beach.